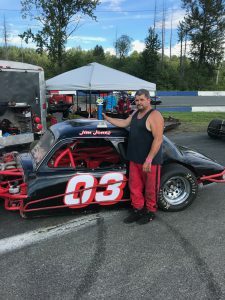 Jim Jones in the #03 car took 5th place in 2018 racing season. 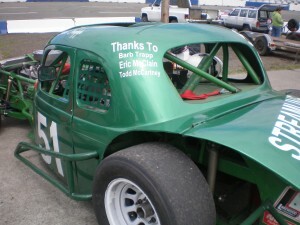 Jim has been racing with Vintage Modifieds for 15-years. 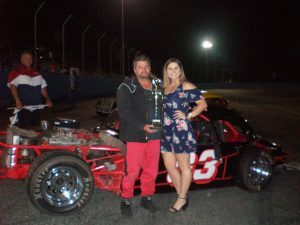 He has several Vintage Modifieds season first place wins over the years. 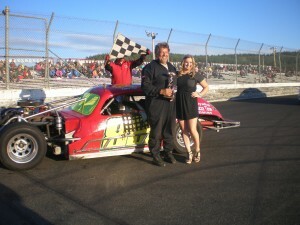 Jim has been racing since 1997 with the Sky Valley Modifieds. 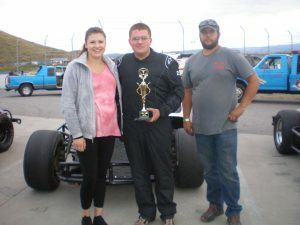 A few of his favorite tracks are Evergreen Speedway in Monroe, Spokane Valley Raceway in Spokane and Yakima Speedway in Yakima. 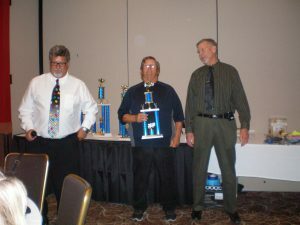 Jim ended his 2018 racing season with a total of 420-points. 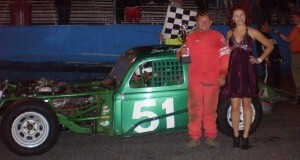 Dave Trapp in the 51-car took 7th place, ending his season with a total of 351-points. 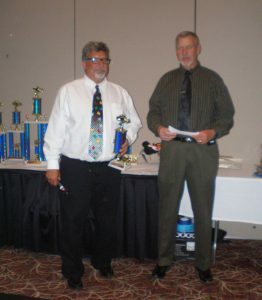 In 1986 Dave was a founding member of VMRA and hasn’t missed many races in the past 32-seasons. Dave has won multiple championships and he has always been a fun guy to be around. 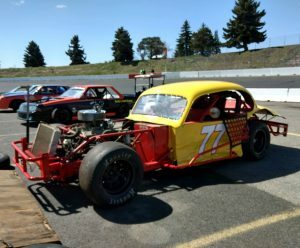 One night at Spanaway Speedway, when our cars were lined-up in the pits waiting for the Main Event, one of the drivers got into his car to get fastened in and ready to race; but, his steering wheel was missing. As he looked around and up the line of cars, there was Dave laughing as he was walking with the steering wheel held over his head. 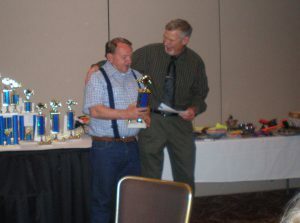 Congratulations Dave for another fun season. 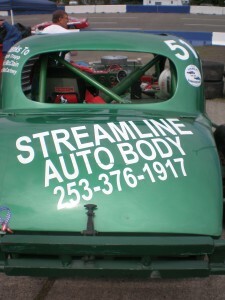 Special thank you to Barbara Trapp, Todd McCartney and Streamline Auto Body. 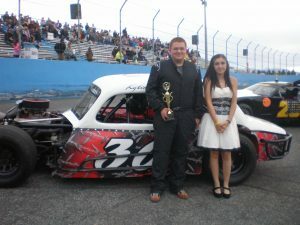 Robert Rux in the 88-car took 8th place, ending his season with a total of 296-points. 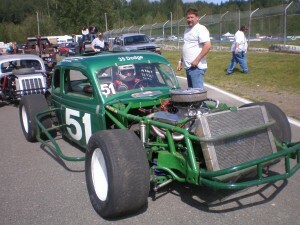 Robert began his racing hobby at Spanaway Speedway. 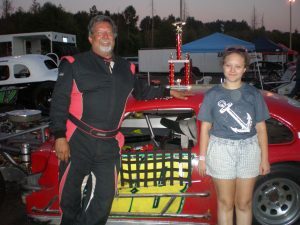 He came to Vintage Modifieds in 1998, and with the exception of a couple years in Street Stocks at Spanaway Speedway has been an active Vintage member ever since. Robert held the position on the board as president for 3-years. 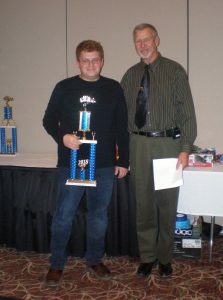 There were a few years in a row that he was awarded the, “Hard Luck” award and the joke began to call it the “Robert Rux Hard Luck” award. 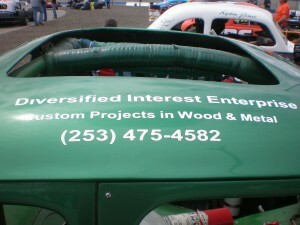 Also, in the past, his 88-car was voted best appearing car. Robert, along with his wife Micki, are responsible for the shirts, hats and souvenirs that we all wear. They both have been very involved in fundraising efforts for the club. Robert recently sold his car, rumors have it that he has already purchased a replacement. 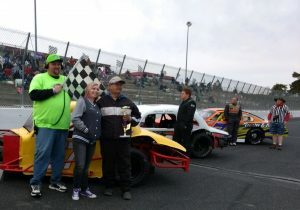 Congratulations Robert for another fun year of racing. 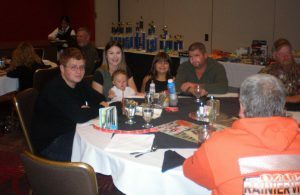 During the banquet there was a 50/50 drawing. Robert had the winning ticket. What a great night. 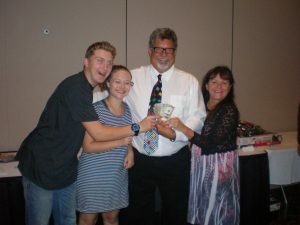 Pictured with Robert and his 50/50 winning ticket are Nate, Helen Rose and Micki. Sentenial Law Group – P.C.